2017 is bound to be an exciting year in Data Science. Here's DataCamp's list of conferences that we're most excited about in the new year. 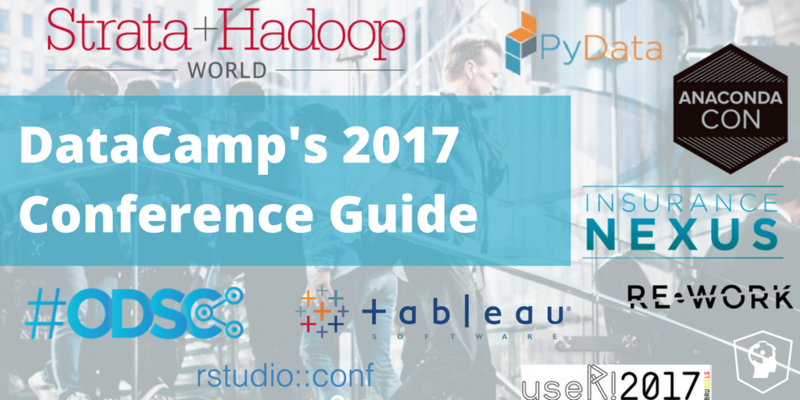 Whether you're an R user, a Python hacker, or just a general data science fan - you're sure to find a great conference to attend next year on this list! The Open Data Science Conference (ODSC) is a fantastic option for aspiring data scientists and analytics teams looking to learn the latest and greatest techniques. ODSC conferences are hosted throughout the year in multiple locations across the world, which gives you a lot of flexibility in choosing a time and place that works for your team. ODSC brings together the best and brightest in the Data Science community to discuss topics like deep learning, data wrangling, and predictive analytics. You'll gain exposure to new programming languages and data science tools like R, Python, NoSQL, Julia, Apache Spark, Hadoop, Neo4J, R-Shiny and much, much more! If you decide to register, you'll be in good company as teams from the most influential tech companies (Facebook, Google, Netflix, Uber, etc.) are known to attend. Tableau Conference is returning to Las Vegas, October 9-13, 2017. Tableau Conference provides hundreds of hands-on training sessions and networking opportunities giving you countless ways to learn. You'll be joined by thousands of data professionals in an energetic, informative environment. You can even take advantage of their Data Night Out party to network with some of the best in the industry. Presented by O'Reilly and Cloudera, the Strata + Hadoop World Conferences let attendees experience the intersection of cutting-edge data science topics and business fundamentals. Like ODSC, Strata + Hadoop World Conferences are scheduled at various times and locations throughout 2017 including San Jose (March 13-16, 2017), London (May 22-25, 2017), New York (September 25-28, 2017), and Singapore (Dec 4-7, 2017). Strata + Hadoop World attracts all sorts of analytics professionals including data analysts, data scientists, developers, CIOs, CTOs, VPs and more! Whether you're looking to hire new analytics talent or how to leverage and scale data science in your own business - the Strata + Hadoop World Conferences are a fantastic place to start! Teredata Partners Conference, hosted by Teradata, is a customer-led global data science conference. This unique format means that a panel of customers select 80% of the session content which is then brought to life by industry practitioners and experts in the chosen topic. Attendees can choose between different tracks, including a "business" track and a "technical" track - meaning anyone from your organization can find value and learn something new. Any R users in your organization? Then this conference is certainly worth your attention. rstudio::conf, by RStudio, provides an opportunity for R programmers to boost their knowledge and meet with members from the R community. Here's just a couple of things RStudio say's you'll learn: how to write better shiny applications, understand the new capabilities of the R Markdown authoring framework, apply R to big data and Spark, explore the “tidyverse” of tools for data science, discover best practices and tips for coding with RStudio, investigate enterprise scale development and deployment practices and tools – including the new RStudio Connect. AnacondaCON 2017 is a must for any Python for data science professionals. AnacondaCON is the place to fast track your current knowledge of Open Data Science, through engagement with visionaries who have established modern Open Data Science technology and are pioneering its evolution. You’ll learn best practices and how other thought leaders are leveraging Anaconda to accelerate the value from their data. This 3-day conference will feature speakers like Blake Borgeson from Recursion Pharmaceuticals and Hilary Mason of Fast Forward Labs. DataCamp's own Jonathan Cornelissen will also be speaking at the event, so don't miss out! Another important conference for R users to mark on their calendar is useR! 2017. The annual useR! conference is the main meeting of the international R user and developer community. Its program consists of both invited and user-contributed presentations.The invited keynote lectures cover a broad spectrum of topics ranging from technical and R-related computing issues to general statistical topics of current interest. This year these topics include R in Business and Industry, Bioinformatics, Economics, Finance and Insurance, Machine Learning and predictive models, and much more! Python users should also take note of upcoming PyData conferences including PyData London 2017 hosted by Bloomberg. PyData brings together the data analysis community to share ideas and learn from each other. The goals are to provide data science enthusiasts, across various domains, a place to discuss how best to apply languages and tools to the challenges of data management, processing, analytics, and visualization with Python. The annual SciPy Conferences allows participants from academic, commercial, and governmental organizations to showcase their latest Scientific Python projects, learn from skilled users and developers, and collaborate on code development. The conferences generally consists of multiple days of tutorials followed by two-three days of presentations, and concludes with 1-2 days developer sprints on projects of interest to the attendees. Re·Work's Deep Leaning in Healthcare Summit (co-located with the Deep Learning Summit) is a fantastic opportunity for those in the healthcare/bioinformatics community to learn ways deep learning tools can revolutionize their industry. The speaker list includes representatives from Phillips Research, Vertex Pharmaceuticals, GenomeDx Biosciences, Inc., Harvard Medical School and more! This summit will feature topics such as personalized medicine, diagnostics, natural language processing, medtech, and a variety of other important topics in the field. With a list of past attendees including names like Procter & Gamble, GlaxoSmithKline, Roche, Johnson & Johnson, and more - you definitely won't want to miss out. For those in the insurance industry, the Insurance Nexus USA 2017 conference should definitely be on your radar. This event brings together 300+ attendees and 40+ industry speakers to discuss innovative data strategies in the field. 70% of the attendees are from the insurance industry so this is an ideal conference for attendees focusing on this niche. 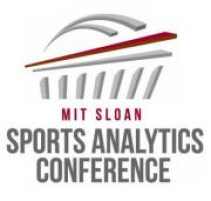 The MIT Sloan Sports Analytics Conference is an opportunity for anyone interested in sports to see how analytics is impacting the industry. The conference features a variety of speakers and panels including owners and managers of large sports organizations, publications, and tech companies. The conference also hosts some exciting events like a Hackathon co-sponsored by ESPN and Ticketmaster as well as case competitions and career development workshops. If you are interested in the intersection of sports and analytics - this is the place to be! What conferences are you interested in attending in 2017? Let us know below! Feeling inspired by your latest conference?